Three deserving Richmond students receive $2,000 bursaries to help further their education in the field of healthcare. 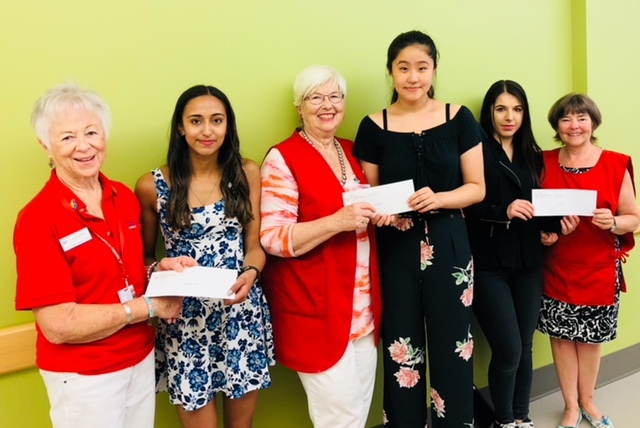 Pictured are (l-r): Colleen Kason (Richmond Hospital/Healthcare Auxiliary Past President), Harmony Sander, Ursula Van Duin (Auxiliary President), Ada Zhang, Ana Basic and Debby Newton (Auxiliary volunteer). Ada Zhang is entering her fourth year in Microbiology and Immunology at UBC and is passionate about becoming a physician. She has done extensive volunteer work in the Recreation Therapy Department at the Richmond Hospital and at Minoru Residence. Ana Basic attended Langara College last year where she focused on Biology, allowing her to become a peer tutor. She will begin the Bachelor of Science in Nursing Program at Langara this fall with a goal of becoming a Nurse Practitioner. Since August 2016, Ana has volunteered 245 hours at Richmond Hospital in a variety of programs including Cancer Care and the Emergency Dept.